Ok ‘Concept Camaro’ fans...this T-shirt edition is for you! 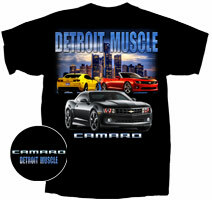 On the left side chest area of the this Tee, we have the detail of the scripts ‘Camaro Detroit Muscle’ as pictured above. The artwork is of the fifth generation concept Camaro’s, by Chevrolet. Firstly, in the forefront we have the 2008 SEMA Camaro Black Concept featureing a matte black hood, tinted glass, HID headlamps with red "halo rings", a darker grille, dark-tinted taillight lenses, and 21 in (533 mm) wheels with a darker finish. The interior has been blacked out. It is powered by the 304 bhp (227 kW) 3.6 L (220 cu in) V6. Next up, on July 22, 2009, GM announced a Transformers Special Edition appearance package for the 2010 Camaro at the 2009 San Diego Comic-Con. The US$995 appearance package (RPO code: CTH) can be applied to LT and SS Camaros with or without the optional RS package and could only be applied to orders made in the Rally Yellow exterior scheme. The package includes an Autobot shield badge on the driver and passenger side panels underneath the Camaro nameplate, Autobot shield on each of the four wheel's center cap, Autobot shield embroidered on interior center console, Transformers logo on driver and passenger doors' sill plates replacing the original "Camaro" labeled plates, high-gloss black center rally stripe package with the Transformers ghost logo embedded.Production of the add-on package ceased on January 12, 2010 with an estimate of 1,500 units to produce straight from Order Workbenches. 1,916 units were finally produced at the end of 2010. And Lastly, on October 19, 2010 at 12pm EDT, orders of the Neiman Marcus Edition Camaro Convertible were opened through Neiman Marcus and sold out within 3 minutes becoming one of quickest selling special edition vehicles that General Motors has put out in the market. A total of 100 units were produced and sold at a MSRP of $75,000 which owners received delivery of in early 2011. The NM Camaro was built under both the 1SS and 2SS models providing with the 6.2L V8 engine in both options of either manual or automatic transmissions with the equal fuel efficiency and horsepower of the 2011 Camaros. Accessories that separated this edition from the rest were noticeably that of the exclusive tri-coat exterior paint called "Deep Bourdeaux" with ghosted rally stripes spanning across the hood to the rear deck along with a separate "Silver" painted windshield surround. A two-toned interior leather trim also separated the special edition from the rest with basic black leather with "Amber" interior accents on the front and rear seats as well as on the armrests all with accented "Brilliant Red" stitching on the aforementioned including the center console, steering wheel, and shift knob. A black interior trim kit placed upon the doors panels and dash which replaced the standard "Midnight Silver" that came in standard 2LT and 2SS models. 21" five spoke wheels that were not yet released to the general public for separate purchasing until late 2011 were placed wrapped with Pirelli P-Zero tires that also contained a Brilliant Red strip flowing along the outer edge of the wheel to follow that stitching in the interior. 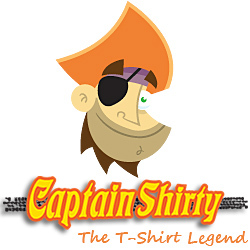 Tee shirt Colour: Available in Black only, with Genuine Official Licensed Merchandise Tag.